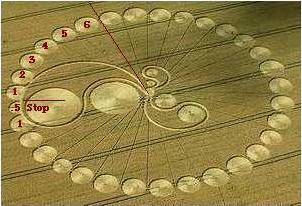 The July 20 Hackpen Hill circle shows Planet X in the Ying-Yang symbol is now pushing away the Sun's magnetic field influence on Earth. Retrograde motion (clockwise) of Planet X represented. 36 hour day when rotation stops noted. 5.9 days of stoppage prior to shift noted. Remaining days leading up to stoppage left deliberately vague.